Thin-plated structures are used extensively in building construction, automobile, aircraft, shipbuilding and other industries because of a number of favourable factors such as high strength-weight ratio, development of new materials and processes and the availability of efficient analytical methods. This class of structure is made by joining thin plates together at their edges and they rely for their rigidity and strength upon the tremendous stiffness and load-carrying capacity of the flat plates from which they are made. Many of the problems encountered in these structures arise because of the effects of local buckling. The knowledge of various facets of this phenomenon has increased dramatically since the 1960s. Problem areas which were hitherto either too complex for rigorous analysis or whose subtleties were not fully realized have in these years been subjected to intensive study. Great advances have been made in the areas of inelastic buckling. The growth in use of lightweight strong materials, such as fibre-reinforced plastics has also been a contributory factor towards the need for advances in the knowledge of the far post-buckling range. The conference is a sequel to the international conference organised by the University of Strathclyde in December 1996 and this international gathering will provide the opportunity for discussion of recent developments and trends in design of thin-walled structures. For academics, researchers and practising civil and structural engineers concerned with advances in design of thin-walled structures. Section headings and selected papers: Keynote Papers. 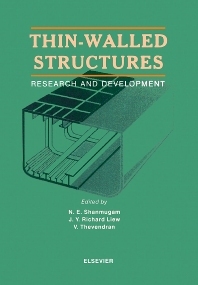 Smart thin-walled structures (K.P. Chong, B.K. Wada). Light gauge steel framing for house construction (J.M. Davies). Design of steel arches (N.S. Trahair et al.). General Session Papers. Section I: Aluminum. Buckling of aluminum plates (M. Langseth et al.). Section II: Cold-Formed and Light Gauge Steel Structures. Local failures in trapezoidal steel claddings (M. Mahendran, R.B. Tang). Section III: Composite and Ferrocement. Lateral distortional buckling of composite cantilevers (M.A. Bradford). The dynamic response of filled thin-walled steel sections (H.D. Wright, A.W. Mohamed). Section IV: Compression Members. Design procedures for stub-columns (K.Y. Teo, S.M. Chou). Influences of welding imperfections on buckling/ultimate strength of ship bottom plating subjected to combined bi-axial thrust & lateral pressure (T. Yao et al.). Section V: Analysis and Design. A rectangular plate element for ultimate strength analysis (K. Masaoka et al.). Investigation of collapsed rack storage systems (R.H.R. Tide, F.A. Calabrese). Section VI: Perforated Members. Design of perforated plates under in-plane compression (V. Thevendran et al.). Section VII: Shells and Pressure Vessels. Inelastic buckling of a layered conical shell (J. Zielnica). Strength of reticulated shells designed by second-order elastic analysis (S. Kato et al.). Section VIII: Shear and Bending. Dynamic equilibriums of nonprismatic thin-walled beams considering the effects of transverse shear deformations defined on an arbitrary coordinate system (C.N. Chen). Section IX: Tubular Members and Bridge Piers. Cyclic loading test of steel octagonal section pier models (M. Suzuki, T. Aoki). Elasto-plastic instability of steel compression tubular members subjected to cyclically applied bi-directional horizontal loads (E. Watanabe et al.). Author index. Keyword index. Department of Civil Engineering, The National University of Singapore, Singapore.